The finest of margins separated these two sides in MacHale Park on Sunday afternoon, after looking like they were on the verge of a trimming 12 minutes in when they trailed by 0-7 to 0-1, Mayo came within inches of knocking Galway of their throne as the Queens of Connacht with a heroic display that came up just short in the final few minutes, where Galway’s greater composure in front of the posts saw them edge this battle. There’s not much left to be written about the greatness of Cora Staunton and the impact that she has left on the ladies game and once again she was the stand out performer. The Carnacon ace kicked 1-15 of Mayo’s total, with 1-5 of it coming from play. 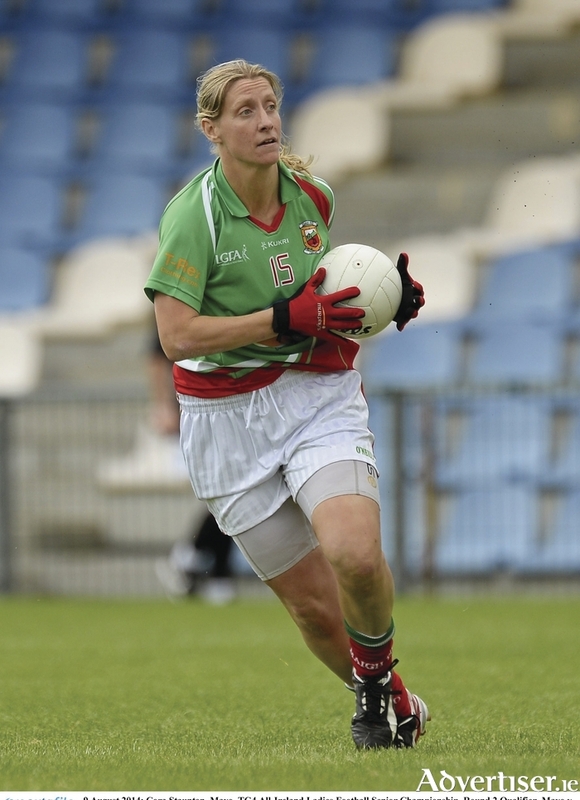 Her converted free kick from well out past the 45 meter line in the second half to put Mayo into a two point lead was a wondrous score that not many players in the mens game could equal. But she wasn’t alone in her excellence for Mayo with the likes of Fiona McHale, Martha Carter, Niamh Kelly and Aileen Gilroy all putting in massive shifts as did everyone in Frank Brown’s charges in green and red. But it was Galway’s day with their full forward line of Roisin Leonard, Tracey Leonard and Olivia Divilly outstanding, with some of Tracey Leonard’s point taking and foot passing a joy to watch. Galway hit the ground running early on with Annette Clarke’s kicking three points inside the opening 12 minutes with Tracey Leonard, Maria Hoey, Louise Ward and Caitriona Cormican all also raising the white flag, Mayo’s only response was free from Cora Staunton three minutes in. Mayo were rattled and on the ropes, but they regrouped with during one of the numerous stoppages that saw the action not he field last for 45 minutes before the break and by the half’s end they’d closed the gap to two points with Galway going in leading by 0-11 to 0-9. All of Mayo’s scores in the opening half game from the boot of Staunton. She took the game to Galway on the scoreboard and Galway were struggling to contain her. The second half started with Olivia Divilly pointing for Galway before Mayo reeled off 1-3 without reply to go three points clear. Staunton pointed from a free a minute in, then two minutes later she found the back of the net after winning a long ball into the danger area, she rounded her marker and then sold a dummy to the keeper before finishing low to the net to put Mayo into the lead for the first time. Niamh Kelly followed that up within seconds and a minute later Staunton kicked another point from a free and the belief was flowing their Mayo’s veins. Galway hit back with a fine score form Tracey Leonard, but Mayo pushed right back at them with Staunton kicking another pointed free. The Tribeswomen weren’t going to bend the knee easily either and Roisin and Tracey Leonard kicked points to leave jus tone between the sides. Mayo bounced straight back at them with Staunton landing another score and Fiona McHale shooting over the bar to keep the gap at three points. It was frantic stuff with each side trading scores and with five minutes left of the clock Roisin Leonard kicked a sublime point to tie the game up at 1-16 to 0-19, but back down the field went Mayo and Staunton put her side back in front for the final time in the game with four minutes left on the countdown clock. Two minutes later, it was level once again when Tracey Leonard put the ball between the uprights with a calm and composed finish. It was all or nothing now for both sides, but it was Galway who struck for home and Tracey Leonard showed great awareness to find sub Patrica Gleeson lurking on the edge of the D and the Corofin girl showed nerves of steel to ease the ball over the bar and seal the win for her side. With the clock counting down the final 45 seconds, Galway played keep ball until the hooter sounded and retained their Connacht senior title but only just. For Mayo while they’ll be gutted that they couldn’t seal the deal, they showed enough fight and spirit to show they can make a real impact going on into the summer in the knock-out stages of the championship. Mayo: A Tarpy; M Corbett, M Carter, H Lohan; D Hughes, S Tierney, O Conlon; F McHale (0-1 ), F Doherty; N Kelly (0-1 ), C Staunton (1-15, 10f ), A Gilroy; D Caldwell, Y Byrne, R Kearns. Subs: A Tuohy for D Caldwell, A Duffy for F Doherty. Where did the seats go?